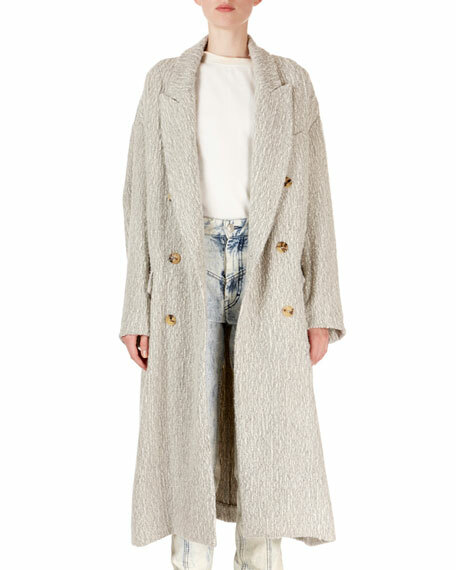 Isabel Marant "Habra" coat in baby alpaca blend. Peak lapel; double breasted front. Co plaid coat with dotted jacquard. Notched lapels. Concealed press-button front. Long sleeves. Side slip pockets. Swing silhouette. Mid-calf length. Co plaid coat with dotted jacquard. Notched lapels. Concealed press-button front. Long sleeves. Side slip pockets. Swing silhouette. Mid-calf length. Polyester/acrylic/wool/other fibers. Imported of Italian materials. Model's measurements: Height 5'10"/177cm, bust 33"/84cm, waist 25.6"/65.2cm, hips 35.8"/91cm, dress size US 2-4/FR 34-36. Mackage "Vane" wool-blend coat with leather sleeves. Approx. 27"L from shoulder to hem. Waterfall collar; open front. Long lamb leather sleeves. Semi-fitted silhouette. Below-hip length hem. Wool. Polyester lining/sleeve filling. Dry clean. Imported. Model's measurements: Height 5'10"/177cm, bust 33"/84cm, waist 25.6"/65.2cm, hips 35.8"/91cm, dress size US 2-4/FR 34-36. 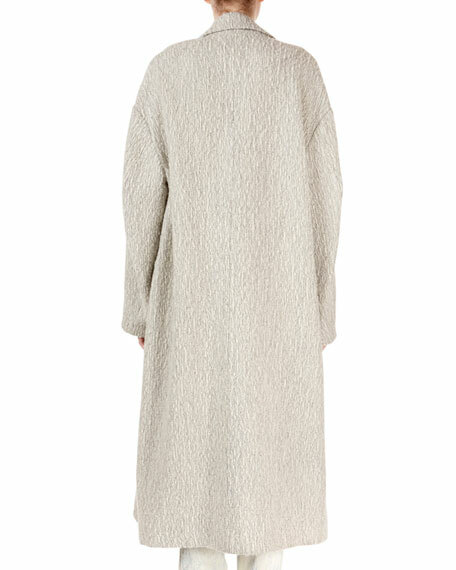 Maxmara teddy coat in camel hair blend. Notched collar; double-breasted button front. Long sleeves. Side slip pockets. Relaxed fit. Mid-calf length. Camel hair/silk. Lining, viscose. Made in Italy. Model's measurements: Height 5'10"/177cm, bust 33"/84cm, waist 25.6"/65.2cm, hips 35.8"/91cm, dress size US 2-4/FR 34-36. Nour Hammour coat embellished with flat silvertone studs. Shawl collar; two-button front. Long sleeves. Side slip pockets. Oversized fit. Below hip-length. Wool/cashmere. Lining, rayon. Made in Italy. Model's measurements: Height 5'10"/177cm, bust 33"/84cm, waist 25.6"/65.2cm, hips 35.8"/91cm, dress size US 2-4/FR 34-36.